“I went to sleep with gum in my mouth and now there’s gum in my hair… and I could tell it was going to be a terrible, horrible, no good, very bad day.” So begin the trials and tribulations of Alexander. People of all ages have terrible, horrible days, and Alexander offers us a humorous reminder that things may not be all that bad. As Alexander’s day progresses, he faces a barrage of frustrations from getting smushed in the middle seat of the car, no dessert in his lunch sack, a cavity at the dentist’s office, and being forced to sleep in railroad-train pajamas. He resolves several times to move to Australia. Judith Viorst flawlessly and humorously captures a child’s testy temperament, rendering Alexander sympathetic rather than whiny. An ALA Notable Book, Alexander and the Terrible, Horrible, No Good, Very Bad Day is a great antidote to bad days everywhere, sure to put a smile on even the crabbiest of faces. 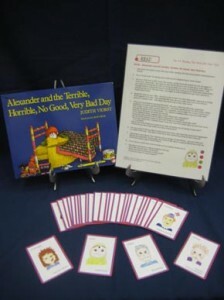 Activity— A memory game using cards with fun illustrations of a variety of different feelings. This game presents a good opportunity to discuss feelings with your child.